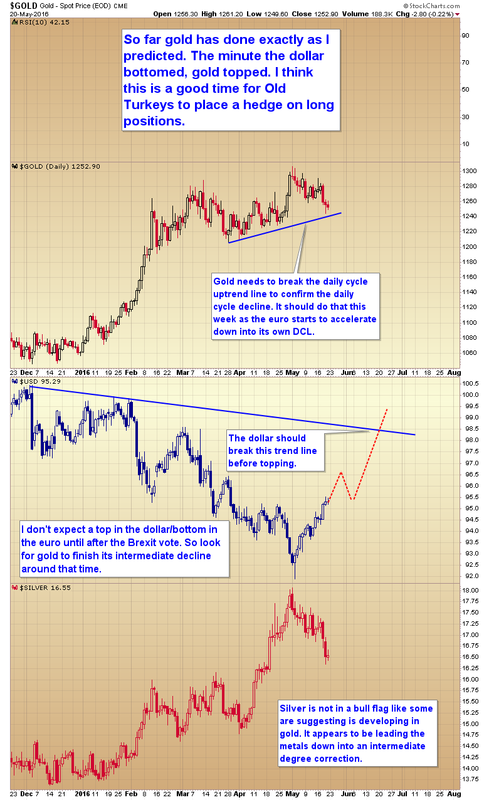 The voice of complacency says no pullback in gold. 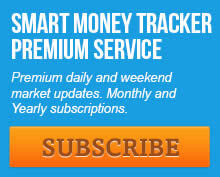 Anyone who took profits will not get a chance to reenter. Here is the chart. Clearly this analyst was expecting gold to soon take out the 2014 high. It’s forming a bull flag and cup and handle patterns in preparation for the rocket launch right? Well this is why I don’t put a lot of faith in chart patterns. They often morph into something else. Doesn’t look much like a bull flag, or a cup and handle anymore does it? I’ve got news for you, We already have a 17% better entry. I’ll say it again. At intermediate turning points, either tops or bottoms, you need different tools to anticipate the turns. 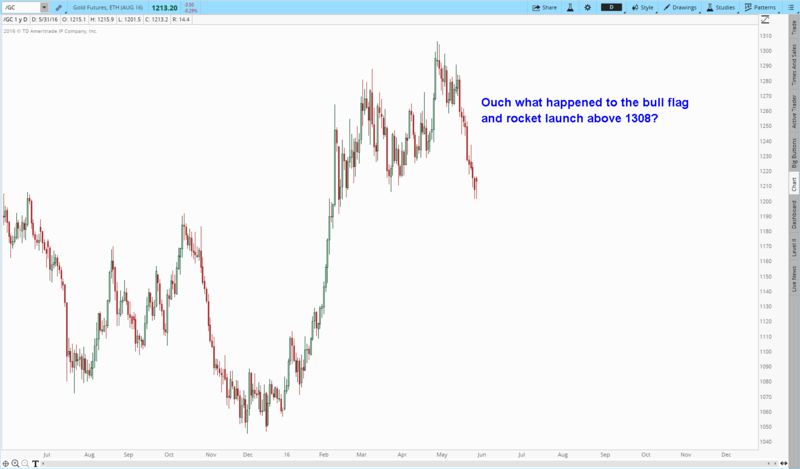 If you strictly follow chart patterns, and technicals like most amateur analysts, more often than not you are going to get caught on the wrong side of the market. And anyone who tries to convince you that the volatile metals market won’t have an intermediate degree correction, or that it will be mild just hasn’t been paying attention. Gold is a very emotional asset for most traders. That means it tends to have big swings in both directions. Let me stress again to have some patience. Both gold and silver will need to break their intermediate trend lines before the intermediate cycle low can be complete. I’d also like to see the commercials reduce their large short position considerably more, and I would like to see sentiment move a lot further in the bearish direction before I try to call an intermediate cycle low. This entry was posted in Uncategorized on May 30, 2016 by Gary. This entry was posted in Uncategorized on May 29, 2016 by Gary. Because most analysts still refuse to recognize the artificial nature of gold’s bear market, they aren’t going to navigate the bottoming pattern correctly. The pendulum is going to swing wildly back and forth for a while during the bottoming process until price calms down and resumes the natural bull market trend in earnest. I said one doesn’t need to chase the rally during the second leg, any gains would not be sustainable and would be given back. At the low yesterday miners had already given back 62% of the second leg gains, and we are not done with the Intermediate Cycle Low yet. The final Intermediate Cycle Low isn’t due until late June or early July. This is why it wasn’t critical to chase the second leg, one was going to get a second shot at it anyway. Unfortunately I suspect too many traders listened to the pie in the sky nonsense that passes as analysis and bought at the top and are now suffering a 10% draw down that they didn’t need to weather, and it’s going to get worse before the Intermediate Cycle Low is finished. This entry was posted in Uncategorized on May 26, 2016 by Gary. It’s time for a short term bounce, but don’t be fooled, the intermediate degree correction isn’t done yet. Gold has to generate at least one failed and left translated daily cycle before the intermediate cycle low is complete. This entry was posted in Uncategorized on May 25, 2016 by Gary. This entry was posted in Uncategorized on May 24, 2016 by Gary. So far gold has done exactly as I predicted. The minute the dollar bottomed, gold topped. 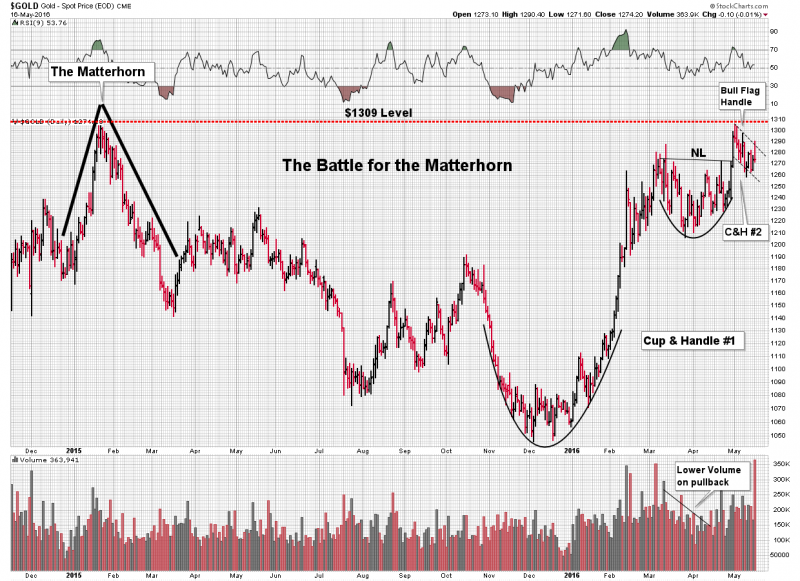 I think this is a good time for Old Turkeys to place a hedge on their metals positions. 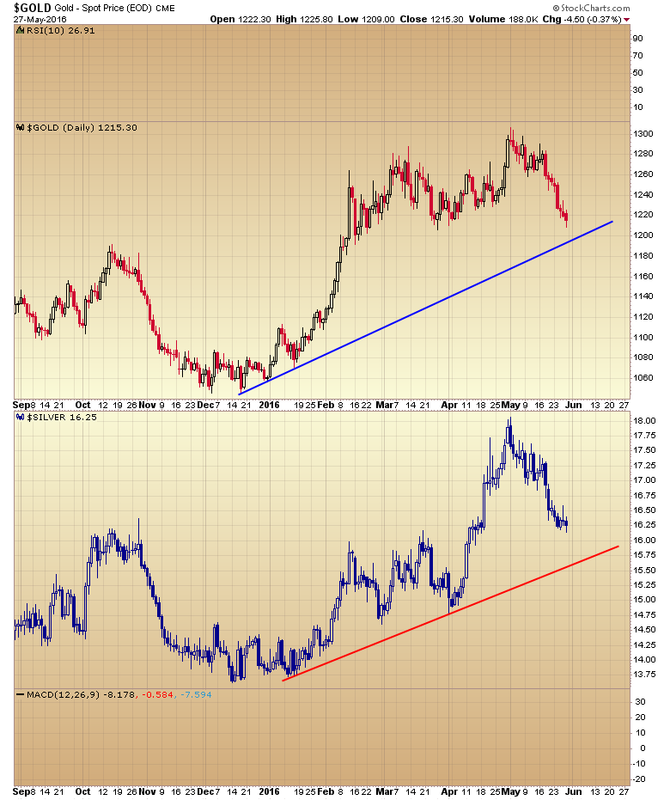 Gold needs to break the daily cycle uptrend line to confirm the daily cycle decline has begun. It should do that this week as the Euro starts to accelerate down into its own daily cycle low. I don’t expect a top in the dollar / bottom in the Euro until after the Brexit vote. 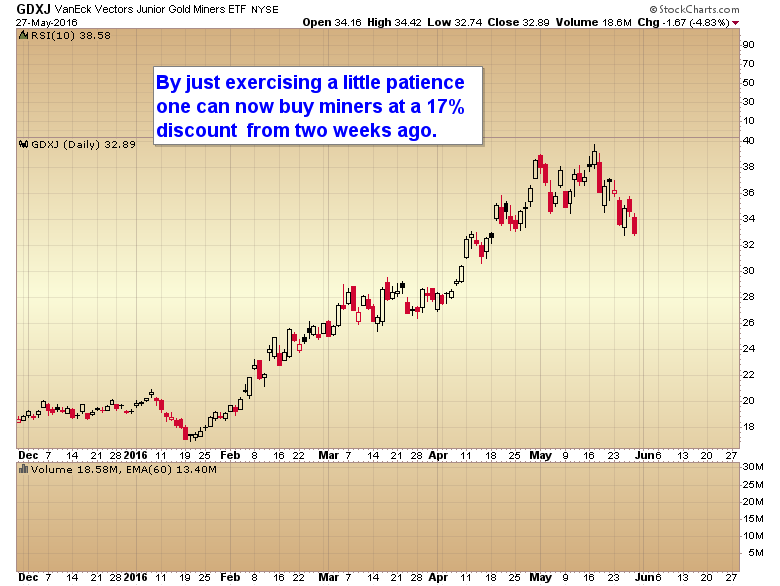 So look for gold to finish its intermediate decline around that time. Silver is not in a bull flag like some are suggesting is developing in gold. 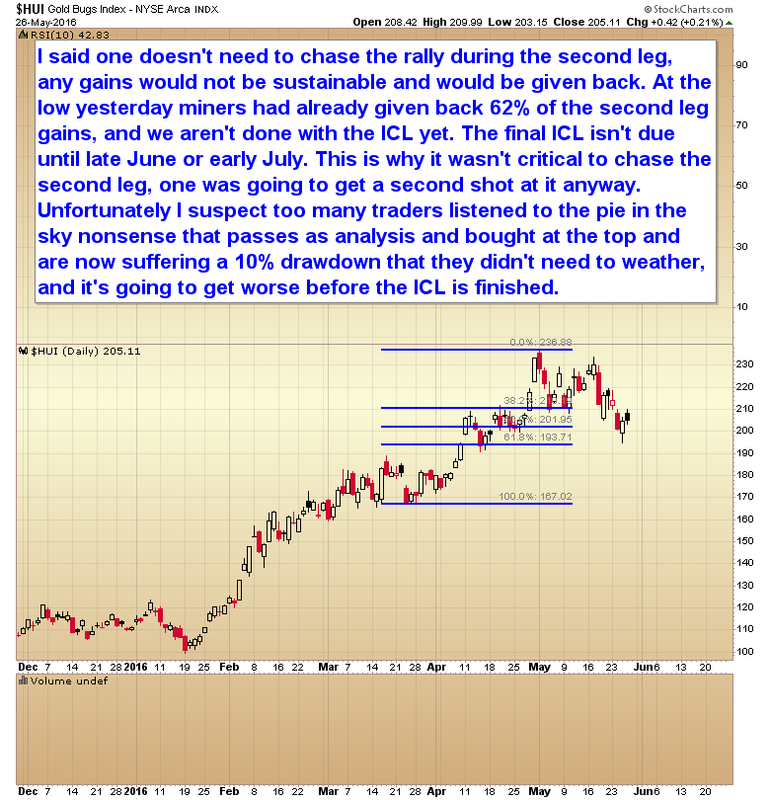 It appears to be leading the metals down into an intermediate degree correction. If you try hard enough you can always find a set of moving averages that will confirm your bias. 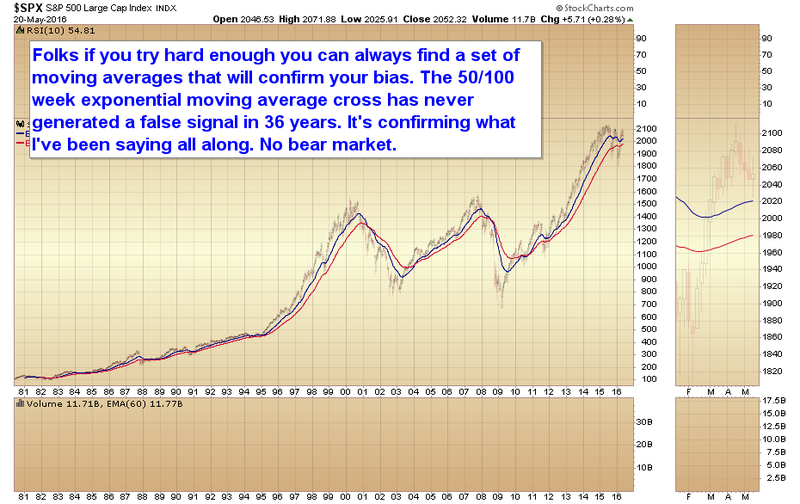 The 50/100 week exponential moving average cross has never generated a false signal in 36 years. It’s confirming what I’ve been saying all along. No bear market. This entry was posted in Uncategorized on May 21, 2016 by Gary. This entry was posted in Uncategorized on May 20, 2016 by Gary.